Rabbi Prof. Saul Lieberman saw his Hayerushalmi Kiphshuto as one of the first steps towards his aspired goal: publishing a new and revised edition of the Talmud Yerushalmi. This exceptional book was first published more than seventy years ago. However, Lieberman continued to write and rewrite his work after it was published, making additions, corrections, and changes. 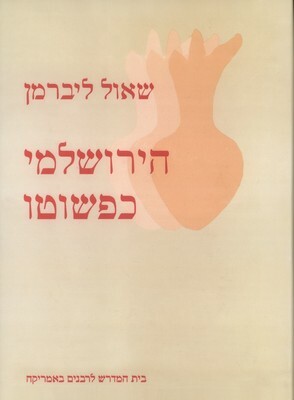 Dr. Menachem Katz examined a whole range of Lieberman's writings, and for this new updated edition cites cross-references with other publications, in which Lieberman made modifications to Hayerushalmi Kiphshuto. Furthermore, the preface of this book includes references to other publications of Lieberman, in which he corrected himself and revised his own theories.